We picked this hotel as it was recommended for good home cooked Greek food. Which we never got to try as the kitchen was closed the whole time we were there, the bar was suppose to open at 9 o'clock in the morning which happen once it should close down around 11pm but was always shut at between 8pm-8.30pm.We never got to see any staff apart from the holiday rep. I would not recommend this hotel. We booked The Grapevines based on great reviews from previous visitors. I can only suggest that two people, named and highly comlimented, had been kidnapped by space aliens and replaced by 2 people who didn't speak, didn't smile and everything was too much trouble! On the good side, the room was clean and the cleaner was a regular visitor and thorough. The pool was nice, lots of sun beds and brollies. The pool bar was very pleasant and location nice and quiet. On the bad side, the room was small (yes, I said "room" because appartment would be stretching the truth), the pool was freezing (ok, not the owners' fault! ), the brollies got packed away after a few days, there was no food and probably very little drink in the bar and just pouring 2 cokes seem to be a real hassle. To be fair, we arrived in the last week of the season but they were packing up around us (literally putting the whole place away for the winter and locking up) and we waited the last hour outside with our cases as they'd finished and gone, leaving us with no shelter, no loos, no nothing! Would we go back to Zante? Yeah, but earlier in the season. Would we go back to The Grapevines? No! Not until the space aliens bring back the happy people! After reading the last couple of reviews, I can honestly say how surprised I was to here of other's experiences with regards to the service this hotel offers. From the moment we arrived we were made to feel totally welcome by all-that goes for the guests already there as well as Christina and George who run the place. The room was spotless with everything available as detailed in the brochure including, kettle, clean, very cool fridge, clean and modern bathroom with shower curtain and fresh bed lined every other day. We stayed in a larger room above the bar area, the music could never be described as loud but you will hear it during the day, so if like an afternoon nap you may wish to consider this. There are safety deposit facilities in the reception area but they are chargeable. The hotel is set in a very quiet area, there is nothing to disturb you at night and all you will hear are the crickets chirping away and the odd hen clucking in the morning! The bar opens at 9am for breakfast and usually closed at around 11pm. Whilst we where there Christina and George told us that from the 1st of May to the end of October, they would work 7 days a week, from 8.30am to 11.30pm, managing the premises, cooking, serving and generally running everything, so this might go some way to explaining why they are absolutely knackered by the end of October. Anyway, the food prepared by George was fantastic, real Greek home cooking from scratch. Each week the BBQ was a sell out, the food was wonderful, you are given copious amounts of complimentary Ouzo and they even provided fireworks! The hotel does not lay on entertainment but you will find that in the shape of the other guests! A fab bunch of people, funny, interesting and always willing to chat at the bar. Many return every year and have made it their second home, at least for a couple of weeks anyway! On the whole I would not recommended this hotel for families, the rooms are 2 people studios, apart from the couple above the bar which are for 3. There is no on site entertainment for children and the vast majority of guests are couples aged 30-70 so naturally, the whole atmosphere of the place reflects that, but we are a couple with no children and we loved it - the pool was quiet at all times and everyone was so relaxed. George & Christina will look after you while you stay there and nothing is to much trouble for them. They'll get you a taxi or breakfast at noon if you like. As said previously the rooms are kept spotless,and are cleaned most days. Its very quiet there,so if you need to relax and chill out theres not a better place to be. Try the food there, its worth every cent, the BBQ on a Thursday is fantastic too. 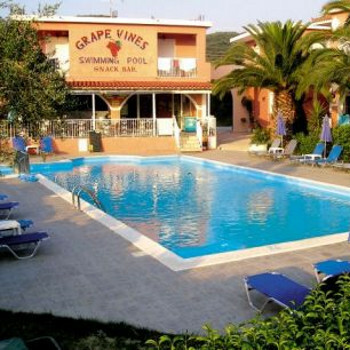 The grapevines is lovley and in a quiet location but only a few minutes frome the main street and 10 mins from the beach. The rooms were clean and all thast we wanted. Christine and George who run the bar are fantastic. These apartments are just off the beaten track, set amongst Grape fields, so it is in a quiet area. Five minutes walk to nearest Restaurants and Shops, 15 minutes to the Beach. Paul looked after the place during the day, he really cares for his guests, always friendly and helpful. In the evenings, Christin & George took over, they are the Managers. Again, warm and friendly people. The apartments are Studios and so it is mainly couples who come here. These are kept spotlessly clean. It is one of few places we've been to where towels aren't put on sunbeds, very refreshing. Music is played during the day but we didn't find it a hindrance. All food served is excellent, try their salads, also the pizzas, all dishes are freshly made. Friday Night to Wednesday Night, a different speciality is available but you must book this the day before. Thursday is BBQ Night, again, book in advance, there is wine for the ladies and beer for the men, excellent night, even if it is the only entertainment laid on. 6 bottles of water from the Bar will cost you E1.60, 10 cents cheaper than the Supermarket and you haven't got to carry it very far !! Our First Choice Holiday Rep was Gary Carter, he was certainly well on top of his job, at times going beyond the call of duty. It is fair to say, that when we return to Zante, this is where we will come back to.